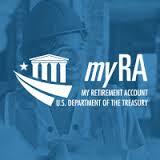 The U.S. Department of the Treasury recently announced the official launch of myRA, a new starter retirement savings account designed for the many American workers who don’t have access to a retirement savings plan through work or haven’t found an easy way to start saving. myRA offers three easy ways to save. Now, in addition to saving from your paycheck via direct deposit, you can also fund your myRA account from your checking or savings account. And at tax time, you will be able to direct all or part of your federal tax refund to your account. It costs nothing to open an account and there are no fees. You can contribute any amount you choose ($2, $20, $200 – whatever fits your budget). Your account safely earns interest. myRA carries no risk of losing money. If you need to, you can withdraw the money you put in without tax and penalty. Open your account at gov. It takes only minutes to sign up. Access your account online and watch your savings grow. You can view your balance or manage your account by logging in to your myRA account online. Why wait? You can start taking more control of your future today. Visit myRA.gov today to get started. 1Annual and lifetime contribution limits and annual earned income limits apply, as do conditions for tax-free withdrawal of earnings. Limits may be adjusted annually for cost-of-living increases. To learn about key features of a Roth IRA and for other requirements and details, go to myRA.gov/roth-ira. Withdraw interest earned without tax and penalty five years after your first contribution if you are over age 59 ½ or meet certain other conditions such as using the funds for the purchase of your first home. Accounts earn interest at the same rate as investments in the Government Securities Fund, which had an average annual return of 3.19% over the ten-year period ending December 2014. This entry was posted in Access to Capital and tagged accounts, checking, federal tax refund, government, Government Securities Fund, income, investments, IRA, lifetime, myRA, requirements, retirement, Retirement Account, savings, tax, tax-free, withdrawal by WIPP. Bookmark the permalink.